Is This The Strangest Wedding Invite You've Seen? At first glance it looks like a fairly standard wedding invitation - that's until you see a strange menu choice listed on the card. 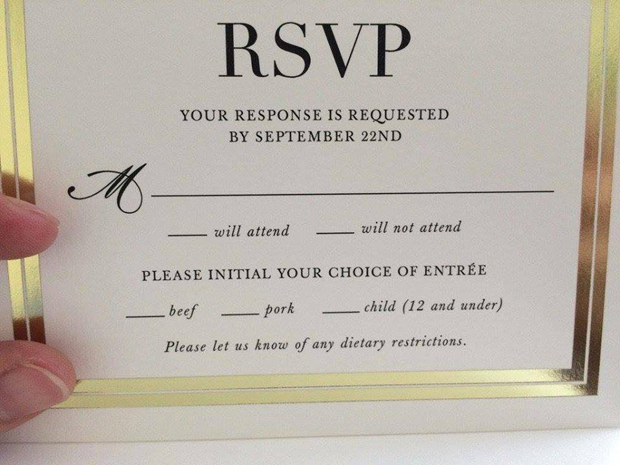 The invite, which was uploaded to Reddit, asks guests to choose between beef, pork... and children. Beneath the menu options, the card then asks guests to "please let us know of any dietary restrictions". The photo of the strange invite has been attracting a range of humorous comments on Reddit, including one user who wrote "Dietary restriction: ginger children" while another joked: "Free roaming and gluten free please." "I'll have the Hansel and Gretel" and another quipped: "I'm Kosher. So only Jewish children, please."